Why commit to a long-term lease when you don’t have to? At Bridgeworks, you can stay as long as you want and cancel when you want. All of our memberships whether a private office or coworking pass are month to month, meaning you can cancel with 30 days notice! All of our private offices are fully furnished, 24/7 accessible, and rentable by the day, week or month. We offer small single person offices up to large offices for remote teams. Alongside your office you will have full access to work in our open lounges, meeting rooms, café, and entertainment rooms. All utilities and amenities are included in our simple monthly rate. Best of all, our packages are month to month. All we require is 30 days notice prior to moving out. Click Here to Learn More about our Office Options. Beautiful All-Inclusive Private Offices for you and your team. No Commitments. Instead of working in a standard office, you will have full access to use all of our locations, common areas, lounges, cafes, and workspaces to use as you please. Don’t limit yourself to one desk when you can have an entire facility. Our Dedicated Desk Membership comes with your own hand-crafted desk and chair. Each room is lockable, allowing you to leave any of your belongings at your desk. Simply set up shop and stay as long as you like! Click Here to Learn More about our Dedicated Desk Options. Your Own Personal Lockable Space You Can Call Home. We handle coffee, wifi, daily cleaning, mail and package handling, office supplies, community management and more so you can focus on growing your business. Looking to work in a shared open space with like-minded peers? 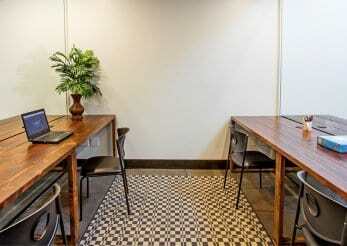 Our coworking packages are as flexible as your business. We offer daily, weekly, and monthly memberships. Experience all of the amenities and more of a shared office space at a much cheaper cost. Our memberships allow for access to work in our lounges, meeting rooms, café, and entertainment rooms. Click Here to Learn More about our Coworking Options. Work With Style Near Our 600 Gallon Aquarium in our Work Café and Lounge or at our collaborative tables. Work in the same space with like-minded professionals who share your values. Meet companies large and small who can help push your business to the next level. Book modern meeting rooms or executive conference rooms, from our site or mobile apps. Reserve rooms in real-time, manage your meetings from one portal. Our conference rooms have projectors, apple tv, and the latest technology for presentations. Click Here to Learn More about our Meeting Room Options. Book Meeting Rooms When You Need It.